We will begin our world tour with The Boom Box Mile on America’s independence day. 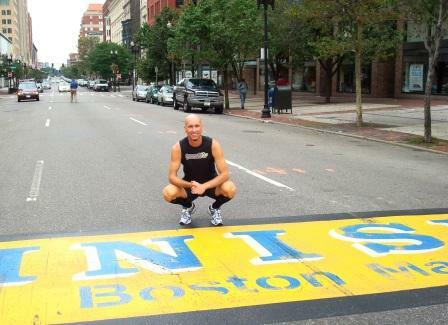 The Boom Box Mile was the USA representative thanks to race director, Charlie Olbrias, who was an integral part of the 20/20/20<5@45 event in 2008 and The SmoothToe New England Marathon…One Mile At A Time in 2009. Due to the interest of Juan Lapadula from Urban Running Tours, Argentina rose to the top for representing South America. One of the sister cities of Tarpon Springs, Florida (my host city for the 20/20/20<5@45 event) is the beautiful and remote Greek island of Symi. Nikos Halkitis from The Symi Visitor and Fiona Hotel will be our host on our long trip (by plane and then boat). I met Nikos at a Tarpon Springs dinner in 2008, we discussed racing in Symi at that time – so it is exciting to see our talks come to fruition. From Greece, we visit the most populated African country – Nigeria. Thanks to their Athletic Association and television interest, we are looking forward to making this stop in Jos a memorable time. Then we travel to a place I still call “Madras.” Since my time in India coaching the national junior Davis Cup team from the mid-80s to the early-90s, India has resumed their Indian names and now it is called Chennai. Due to the efforts of Nina Reddy with O2 Health Studios and Savera Hotels and Ranjini Manian from Global Adjustments, I am looking forward to returning to the city where I began my coaching career. We conclude our world tour in northeast Australia at the Townsville Running Festival on August 8th in Townsville, Queensland. Thanks to the President of the Townsville Road Runners, Anthony Hockings, we will try to break the 30 minute mark at his event. We will keep you updated now that the selection has taken place as we prepare for the event coming in 7 short months. 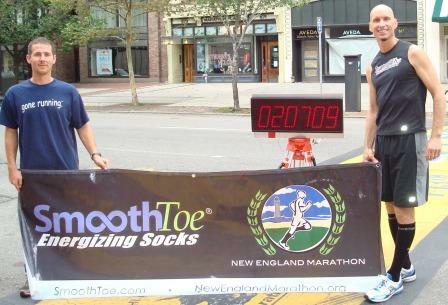 The grand finale of The SmoothToe New England Marathon…One Mile At A Time took place on Boylston Street in Boston, MA. The Boston Marathon finishes directly in front of the Boston Public Library. We ran the last .2 of the Boston Marathon to mark the end of our event. We started with the first mile of the Boston Marathon on July 1st and ended with the last .2 on August 30th. It was a bittersweet celebratory breakfast as we were so pleased how the event went, but sad to see the tour come to completion. It was an amazing journey around New England. The challenges that The Last Mile Racing Management Company overcame setting up and running this event were many, but we came through tired and successful. Thanks to The Last Mile Racing Management Company for making The SmoothToe New England Marathon…One Mile At A Time such a professional, well-run event. It could not have taken place without them. 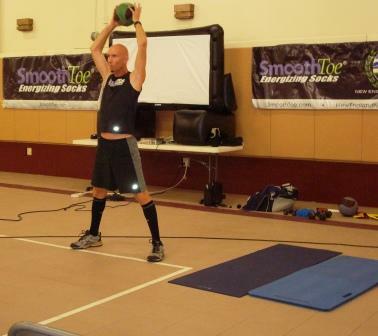 Thanks to our title sponsor, SmoothToe Energizing Socks for supporting this amazing trip around New England. The short recovery time between races showed how important The SmoothToe Energizing Socks were to my preparation, performance, and recovery. As some of you have already heard, www.OneMileRunner.com is going international in 2010. We will shortly announce our 2010 event as we attempt another challenging feat – this time overseas. Race #26 took us to the capital of Connecticut – Hartford. This was the 5th Capitol we visited on our journey. Charlie Olbrias from The Last Mile Racing Management Company had run the Hartford Marathon five times. He knew a good, flat spot around mile marker #12 for us to put on The Capitol Mile #5 race. We had an opportunity to show a different look at running the mile. Check out this short video of my last quarter mile. You can hear me breathing from far away. If you run the mile hard, it hurts. This race was no exception. All that is left is the .2 of The SmoothToe New England Marathon…One Mile At A Time taking place down Boylston Street in downtown Boston Sunday morning. Let’s hope for very little traffic! The last couple of days have been one of my highlights of “The SmoothToe New England Marathon…One Mile At A Time” as it marked the first time that I presented a speaking engagement and raced in the town that I grew up in – Hudson, NH. For many years, one of my oldest friends, Bill Nadeau, has been asking me to speak in Hudson. We thought that 2009 would be a great opportunity to present two talks: one to the teachers of Memorial School where I attended junior high and then a sports talk for the public taking place at The Hudson Community Center. I presented both talks on Tuesday and then raced to The Community Center on Wednesday evening. It was very special to see the support of so many old friends and their families. It was a very windy night and I was fortunate to break 5 minutes in 4:59.08. Thanks to Bill and all his preparatory efforts. We had a wonderful time sharing The O’Meara Process with the teachers of Memorial School. There were still a few teachers on the 2009 staff at Memorial School that were there when I was in 8th grade in 1977! In the evening, I spoke about some of the new fitness exercises at my talk at the Community Center. Now we travel to Hartford, CT for Race #26 and our 5th capital of a New England state. We race in Hartford on Friday evening and then finish in Boston (6th and last Capitol) for a quick .2 on Sunday morning. Race #24 brought us back to the country roads of New England. Sunday evening we raced in Brooklyn, CT which hosts the oldest continuously run agricultural fair in the United States. 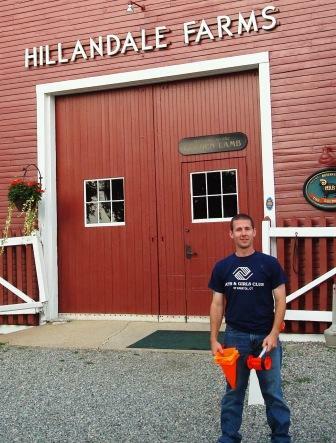 Our race took place out by the beautiful area of Hillandale Farms. It was a wonderfully flat course, but I did not have much bounce left in my legs and could only record a 4:58.43. Here is a photo of Charlie Olbrias from The Last Mile Racing timing company. With only a week remaining on our tour, Charlie and his crew have been invaluable in making The SmoothToe New England Marathon…One Mile At A Time a professional event. Due to their creativity, care, and dedication, we are in the final leg of our logistically and geographically challenging tour around the New England states. Race #25 brings us to Hudson, NH where I grew up. I have two speaking presentations on Tuesday. I speak to the teachers of the school district in the afternoon and then a sports presentation to the general public at the Hudson Recreation Center at 7pm. The following night I race to the Hudson Recreation Center for Race #25…this will be the first time I speak and race in Hudson. Race #21 took place in Hollis, NH a few miles down the road from the Bigelow Chiropractic office www.bigelowchiropractic.com. Dr. Brian Bigelow, The Chiropractic Consultant for www.OneMileRunner.com, was on his bicycle in full support. One of our feature races on The SmoothToe New England Marathon…One Mile At A Time was the D.A.R.E. Classic in Loudon, NH on the Motor Speedway. It is indeed a special race not only for the unique environment, but also for the charitable cause of Drug Abuse Resistance Education (DARE) and the camaraderie of the NH Police. One of the wonderful stories at the 5K race was the Sisters of The St. Charles Home (running in full habit) participating with the children they take care of and discussing the benefits of a running program at their Home.